Bergomensis, Jacobus Philippus [Jacobo Filippo Foresti]. Supplementum supplementi de le Chroniche . . . vulgarizato et hystoriato. Venice: Giovanni Francesco and Giovanni Antonio Rusconi, 1524. Illustrated. With bibliographical note by Cockerell laid in. Provenance: Morris. — Richard Bennett. — Sotheby 1898, lot 163 (sold to Henry Wellcome for £2 2s.). — Henry Wellcome. — Wellcome Library (Closed stores EPB / D 793/D). References: Ellis valuation, fol. 44 (£3). — MS catalogue (2), no. 448 (with two X’s beside the title). 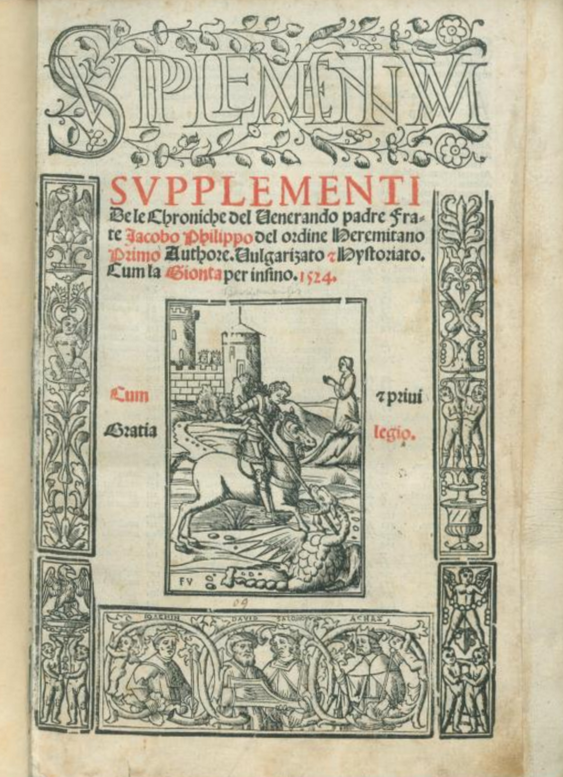 Digital versions: Early European Books (Morris copy).— Internet Archive (Morris copy).